Hotel ok,staff at reception really need to help and smile more,the lady with glasses was very rude..Children and adults entertainment was excellent,beds far too hard and very uncomfortable . Good breakfasts and plenty available for dinner. Entertainment staff worked hard and spent plenty time with both children and adults. Great quality accommodation. Extremely friendly and helpful staff. Animation and entertainment was superb. The breakfast was amazing. Fresh juice and eggs. Rooms were nice, and staff is very friendly. Apartaments were great clean and modern. I only mentioned that we will be celebrating birthday and balloons - fruits sweets and bottle of champagne was placed in our apartment on our arrival. Massive thank you for that. Wonderful beaches within walking distance. Very friendly staff. We got upgraded to a better room for free. The room was very spacious and nice. Very diverse and good breakfast buffet. The pool area is perfect for little children and adults. We had a wonderful stay. Beautiful hotel in a lovely place! Very polite personnel, everyday cleaning, comfortable beds! Perfect breakfasts and dinners! The place was super clean, they left a swiping brush so we could easily get rid of the sand from the beach. It wasn't busy at all, the pool was nearly empty and my little ones loved the splashing area. The hotel is very close to shops and beaches, walking distance from the marina, staff was helpful and very kind. Even with the entertainment in the evening, we were able to go to sleep before 10pm. The place was very quiet till late morning! We moved to a different place for the rest of our holidays and we were sorry to do it 😕 as we ended up in a very busy and not as clean place. This hotel is definitely on our list to come back. 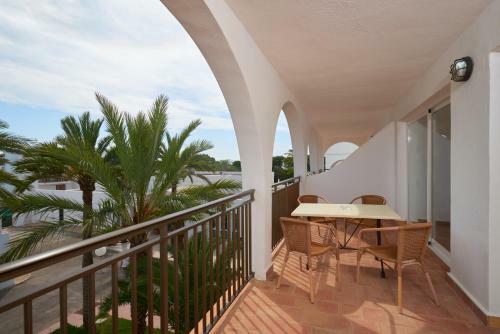 Lock in a great price for Apartamentos Cala d'Or Playa – rated 8.7 by recent guests! Apartamentos Cala d'Or Playa This rating is a reflection of how the property compares to the industry standard when it comes to price, facilities and services available. It's based on a self-evaluation by the property. Use this rating to help choose your stay! Cala d'Or Playa Apartments are a 5-minute walk from Mallorca’s Cala Gran and Cala Esmeralda Beaches. They feature an outdoor swimming pool, children’s pool and mini splash park, and free on-site parking. 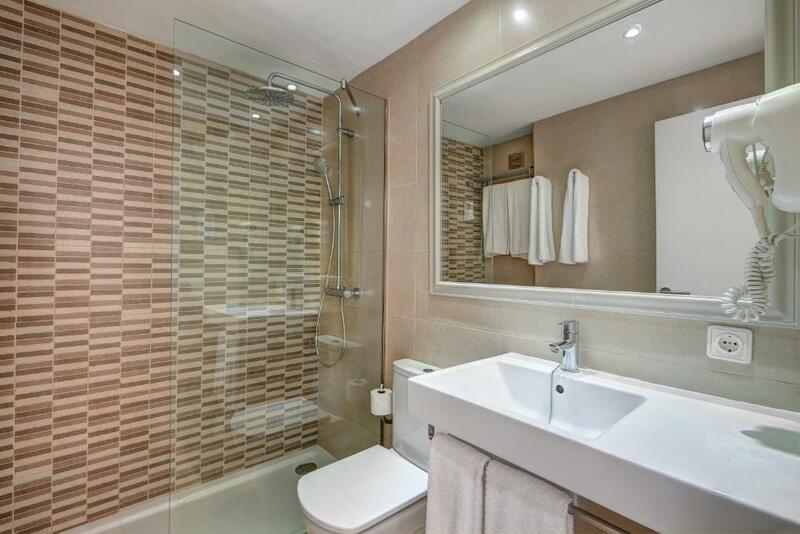 Featuring tile floors and 2 sofa beds, each apartment has satellite TV and a private balcony or terrace. There is a bathroom with a hairdryer, and the well-equipped kitchenette has a ceramic stove, microwave, toaster and teakettle. An iron can be requested. Apartamentos Cala d'Or Playa has a buffet restaurant and a café-bar. The complex is 350 feet from a grocery store. Free Wi-Fi is available in public areas. There is a 24-hour front desk and self-service laundry. Palma Airport is an 1-hour drive away. When would you like to stay at Apartamentos Cala d'Or Playa? 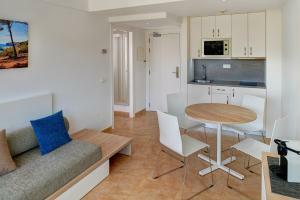 Air-conditioned apartment with a twin bedroom and a balcony or terrace. The living-dining room comes with 2 sofa beds and a satellite TV. The kitchenette includes a ceramic hob, microwave and toaster. Wi-Fi is available for a supplement. This air-conditioned apartment comes with a twin bedroom and either a balcony or terrace with views. The lounge includes 2 sofa beds and satellite TV, while the kitchen is equipped with a fridge, electric hob, microwave and coffeemaker. Wi-Fi is available for a supplement. This air-conditioned apartment comes with a twin bedroom and either a balcony or terrace with views. The lounge includes 2 sofa beds and satellite TV, while the kitchen is equipped with a fridge, ceramic hob, microwave and coffeemaker. Wi-Fi is available for a supplement. House Rules Apartamentos Cala d'Or Playa takes special requests – add in the next step! Apartamentos Cala d&#39;Or Playa accepts these cards and reserves the right to temporarily hold an amount prior to arrival. Apartamentos Cala d'Or Playa accepts these cards and reserves the right to temporarily hold an amount prior to arrival. The water of the shower turned from super hot to cold and back all the time. We had some issues with the internet connection in our room during the first 2-3 days. The connection was very unstable, many times devices would not even connect, or when connected the data could not be transferred and any web page would fail to load. They had the company that manages the wifi come twice and after the second attempt we did not have problems anymore. The guy fixing it said something about an access point being broken and replaced. Overall the speed is decent, but not great. One can browse just fine, and depending on the time of the day, even stream some online videos like Youtube. However, at peak times, especially in the evening the bandwidth is very limited and I guess as all the guests are using the internet, it gets very slow. I would rate it as decent compared to hotels in general. Aside from this small issue, we had a great experience here. This is our second time at this hotel and we had an even better experience compared to last time, which was already hard to beat. The superior rooms were renovated and all was looking great in the room. The staff was great in all of our interactions and I would rate it even more than the maximum. The reception staff was helpful with our internet problems and they took care that all issues are resolved. The restaurant personnel was always with a smile on their face, cheerful and they made us feel welcome there. We had half board included and both breakfast and dinner were great. The food is varied and they had for each evening a "themed" menu. The pool area is very clean, there are plenty of sunbeds at any time of the day and it is a relaxed atmosphere. We did not really use the pool much, but our daughters were very happy with spending time in there. The hotel's private parking is a very nice extra which many hotels don't have in this area. If you have a rented car, knowing there is a place for it in the hotel's private parking is great. We never had problems to find a free spot in the parking, but this may also be due to the fact that we went there in the beginning of October, so not full season. We were so satisfied with the hotel that we are even looking to book a third vacation there! We had everything we needed. There was an incident where our doors were unlocked after cleaner, but that was fixed immediately after reporting. My little girl was missing a swing on the playground 🤔 and porridge for breakfast 😂 Strange that in current times of technology, there is still a charge for the internet in the rooms (€2 per day), at the bar and pool area was free. There was nothing to dislike, it exceeded my expectations, I would recommend this accommodation and would have no hesitation returning. Excellent happy staff, excellent clean refurbished room with everything functional. Cleaners did an excellent job also. Excellent breakfast food and service. Beds a little on the small side? Convenient location with a short walk in to town. Good sized apartments and good bathrooms. Good value breakfast. The location was perfect for families ... short walk from all the restaurants and supermarkets. The apartment was spacious and had everything we required. We used the snack bar and the food and staff was great. Really clean and the entertainment staff were fantastic.